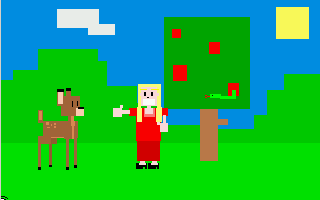 You, Goldilocks, want to enter the forest but Bambi, the forest keeper is stopping you. You must find a way to get past Bambi. Talk to the snake, maybe he knows a solution. The snake can do anything if you give your soul. Talk to the boss about it. The boss suggests to corrupt Bambi. So you get money for your soul. Give the money to Bambi. Oops. He’s eaten it. And you still can’t pass. Talk to the snake again and ask your soul back. The snake can’t do that but can help you in another way so he requests you to pick him up. Take the snake from your inventory and give it to Bambi as a necklace. The snake will take care of Bambi and you can enter the forest.